The average dollar value of an individual TD Reward Point is $0.005. To see how we calculated this, click here. To redeem TD Points or TD Rewards Points for travel purchases charged to your Card that are booked through Expedia for TD, Cardholder can vist ExpediaForTD.com. To redeem TD Points or TD Rewards Points for travel Purchases charged to your Card that are not booked through Expedia For TD, Cardholder must contact the TD Travel Rewards Program / TD Rewards Program after the travel Purchase has been posted to the Account and within 90 days from the transaction date of the travel Purchase. 1Must apply by June 2, 2019. Welcome Bonus of 20,000 TD Points will be awarded to the TD First Class Travel Visa Account (“Account”) only after the first Purchase is made on the Account. To receive the additional 60,000 TD Points, you must make $1,000 in Purchases on your Account, including your first Purchase, within 90 days of Account opening. If you have opened an Account in the last 6 months, you will not be eligible for this offer. We reserve the right to limit the number of Accounts opened by any one person. Rebate of the Annual Fee for the first year for the Primary Cardholder will occur when you have applied for an Account by June 2, 2019. Rebate will be applied within 2 monthly statements from the date of Account opening. The Annual Fee for any Authorized User Cards added to the Account continues to apply. Offer may be changed, withdrawn or extended at any time and cannot be combined with any other offer unless otherwise indicated. 2 Primary Cardholder remains liable for all charges to the Account, including those made by any Authorized User. 5 Subject to carrier/space availability. 6 TD Points do not expire as long as you are a Cardholder. 7 TD Points must be redeemed in minimum 200-point increments for travel Purchases charged to your Card that are booked online or by phone through Expedia For TD. For travel Purchases charged to your Card that are not booked through Expedia For TD, TD Points must be redeemed in minimum increments of 200 or 250 TD Points as fully explained in the TD Travel Rewards Program Terms and Conditions ("Travel Terms") contained in the TD Travel Credit Cardholder Agreement for your Card. The Travel Terms are available on tdcanadatrust.com/agreements. We can decrease the required minimum TD Point redemption increment at any time. 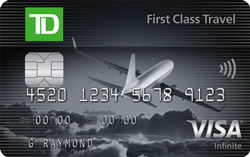 To redeem TD Points for travel Purchases charged to your Card that are not booked through Expedia For TD, Cardholder must contact the TD Travel Rewards Program or visit www.tdrewards.com after the travel Purchase has been posted to the Account and within 90 days from the transaction date of the travel Purchase. The required TD Points will be redeemed from the TD Points balance available at the time the TD Points are redeemed for the travel Purchase, not the transaction date of the travel Purchase. The amount that will be credited toward the travel Purchase will be equal to the value of the TD Points redeemed. If there are insufficient TD Points available to cover the entire amount of the travel Purchase, the Account will only be credited by the value of the TD Points redeemed. Any amount of the travel Purchase not covered by the TD Points redeemed will remain on the Account for payment. 8 Expedia For TD is operated by Expedia, Inc. at www.tdrewards.com and 1-877-222-6492. The Toronto-Dominion Bank and its affiliates are not responsible for any of the services and products offered/provided by Expedia, Inc. Apply online by June 2, 2019 to get a full Annual Fee Rebate1 for the Primary Cardholder for the first year and up to 80,000 TD Points (a travel value of $400 when you book travel purchases through ExpediaForTD.com3) as follows: Welcome Bonus of 20,000 TD Points when you make your first Purchase with your Card1 + 60,000 TD Points when you spend $1,000 within 90 days of Account opening1 . This offer is not available for residents of Quebec. For Quebec residents, please click here.